Stems usually several, 5-15 dm; herbage lightly puberulent basally, glandular-puberulent [glandular-villous] distally. Leaves at midstem with petiole 2-6 cm; blade usually cordate, less often deltate, ovate, or ovate-lanceolate, 5-14 × 3-8 cm. Inflorescences dense clusters of flowers among conspicuous foliaceous bracts 5-20 mm; peduncle 0.5-2 mm; bracts 40-60% connate, 7-11 mm in flower, 10-18 mm in fruit, apex triangular to narrowly triangular. Flowers: perianth white, tube blushed with green or purple, (7-)8-15(-17) cm, pubescent externally. Fruits black to dark brown, bluntly 5-angled in cross section, with low black to dark brown [white] irregular tubercles between angles, ovoid to slightly obovoid, 7-12 mm, base abruptly constricted to truncate, apex tapered to truncate, puberulent between tubercles. 2n = 58. Flowering summer-early fall. Rocky canyons and slopes; 800-2300[-2700] m; Ariz., N.Mex., Tex. ; Mexico; introduced in Europe. A. Le Duc (1995) and B. L. Turner (1993b) recognized two varieties, Mirabilis longiflora var. longiflora, restricted to the Mexican trans-volcanic belt, and var. 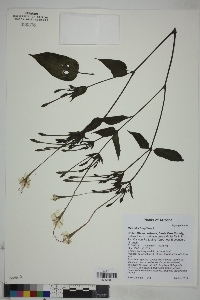 wrightiana found from central Mexico to the southwestern United States. Recent United States floras have recognized only the var. wrightiana, both varieties, or have not recognized infraspecific taxa north of the Mexican border. Characters used to distinguish the varieties are thoroughly mixed. H. M. Hernández (1990) found an absence of insect visitors in this apparently sphingid-adapted species, with the plants self-compatible and probably highly autogamous.